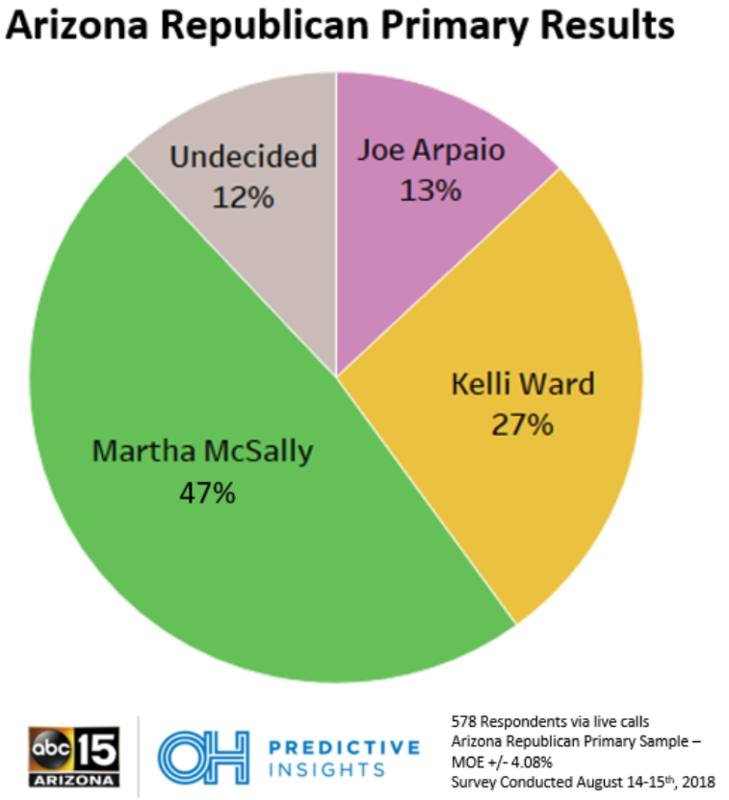 PHOENIX (August 16, 2018) – A new poll from OH Predictive Insights shows that undecided voters have overwhelmingly shifted to Representative Martha McSally, who now holds a wide advantage in the Arizona Republican primary race to replace U.S. Senator Jeff Flake. OH Predictive Insights and ABC15 Arizona (OHPI/ABC15) teamed up to find out who is currently winning the U.S. Senate race and why. Martha McSally now commands 47% of the primary vote, a large gain from only the 35% in OH Predictive Insight’s previous poll over three weeks ago. Kelli Ward remains at the exact same share, while Joe Arpaio fell even farther, now cemented in third place as a definite spoiler to Ward. The big change from the last poll is that the number of undecideds plummeted in Maricopa County, the largest population center in Arizona, from 29% undecided to 14% undecided voters. The lion’s share went to McSally, as she now commands a majority in the county (51%), providing a huge boost to her total, especially as she only pulls in 37% of the vote in the very conservative rural areas of the state. Following a sizeable spend attacking Kelli Ward and Joe Arpaio’s bizarre interview with comedian Sacha Baron Cohen, undecided voters have decided to back Martha McSally in droves in the closing weeks. 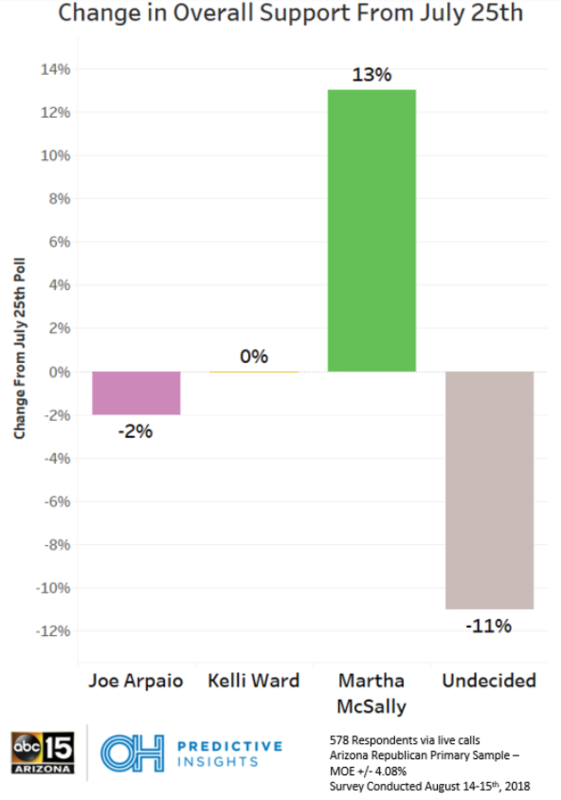 Since the poll in July, undecideds fell 11%, and even Arpaio’s numbers took a hit, while McSally went up by 12 points and Ward’s numbers remained stagnant. “While the more conservative candidates’ totals combined near McSally’s 47%, the fact that they remain split gives McSally a huge lead entering the final stretch,” said Noah Rudnick, data analyst at OH Predictive Insights. Methodology: This IVR telephone survey was completed by OH Predictive Insights in partnership with ABC15-Phoenix (OHPI/ABC15) on August 14th thru 15th, 2018, from a likely Arizona 2018 Republican Primary voter sample. The sample demographics accurately reflected party affiliation, geographic location, gender, and age. 89.3% of respondents were Republican and 10.7% were Independent voters. 100% of respondents were completed via landline. The sample size was 578 completed surveys, with a MoE of ±4.08%.